Full control from your mobile. Without employees. No training required. Discover our successful business model! 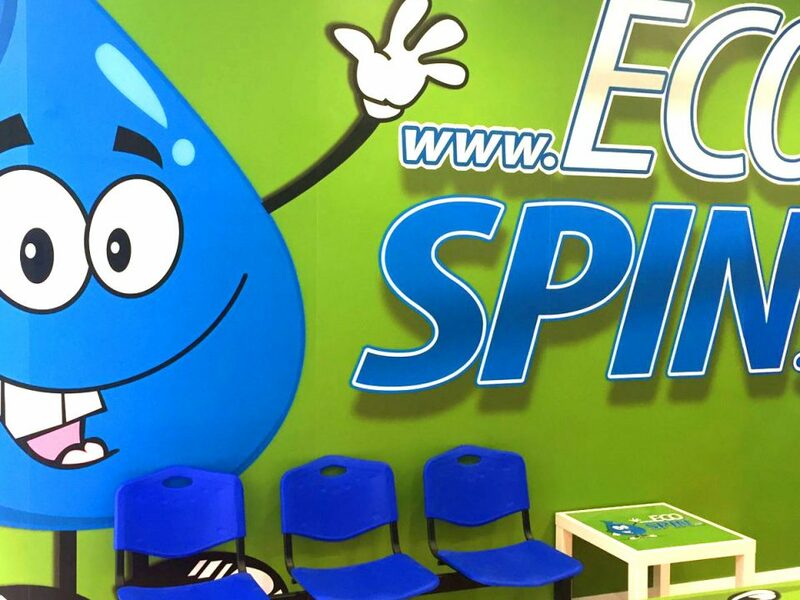 EcosPin is the best investment opportunity in self-service laundries. It is a business model with proven success for those entrepreneurs who want to open their own business and be their own boss. 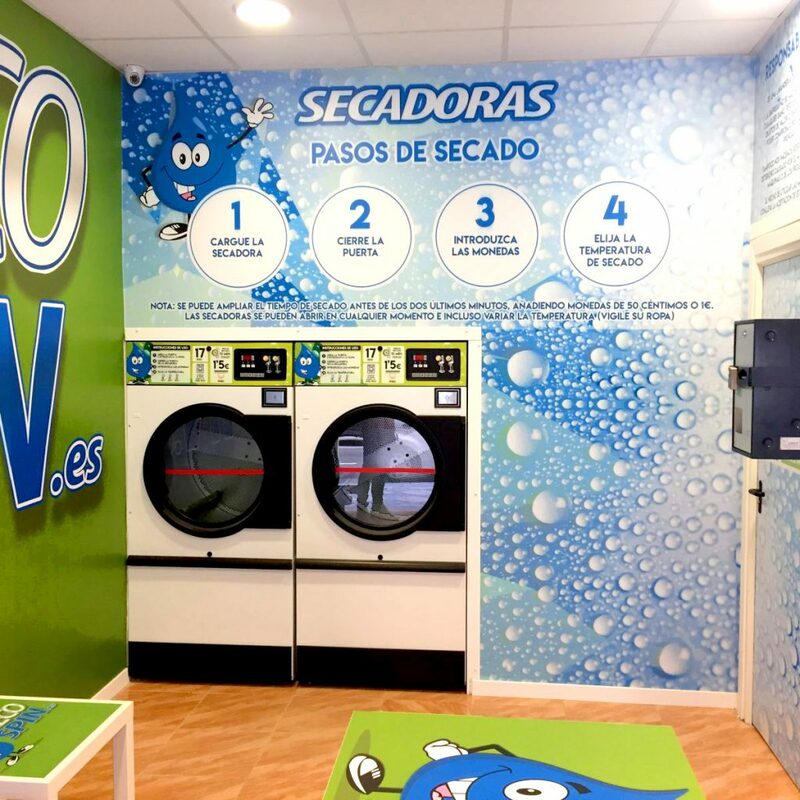 We have several self-service laundries in Campo de Gibraltar: every day, our laundry concept appeals to new entrepreneurs from all over Spain. 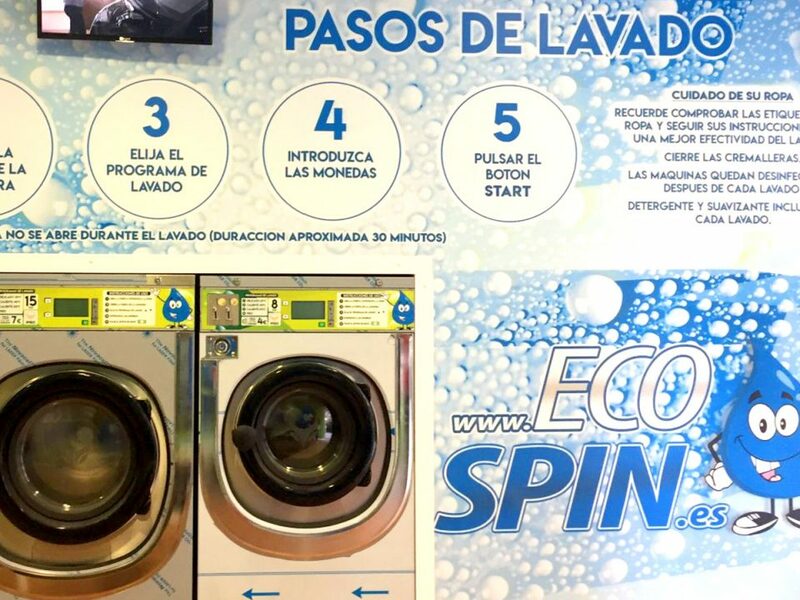 You will control everything that happens in your Laundromat from your mobile, tablet or computer. 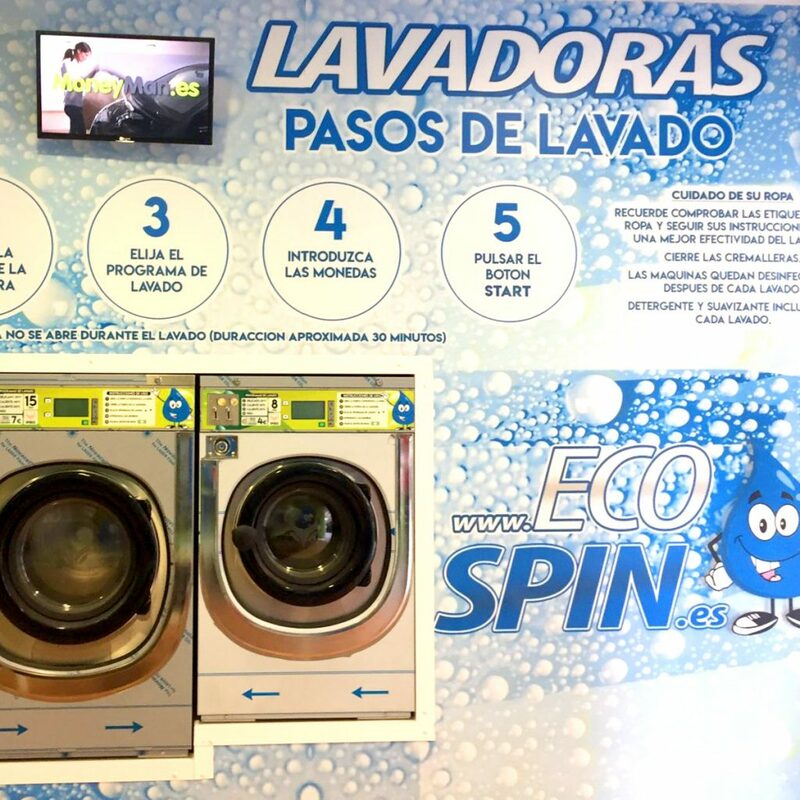 Machines specially prepared and adapted for use in self-service laundries that channel their benefits contemplating savings. 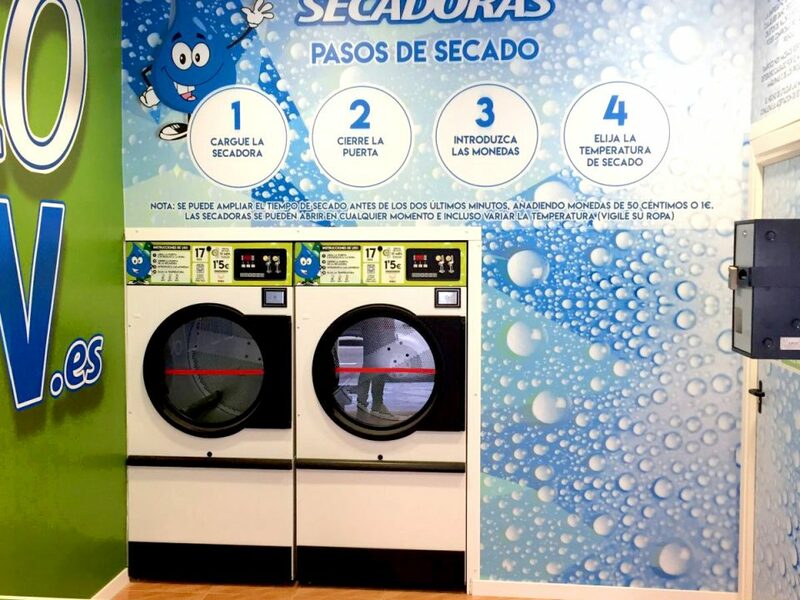 The period of recovery of your investment in our self-service laundries is between 3 and 5 years. It is a crisis-proof business. You will not have to worry about anything. We’ll take care of everything. No staff costs,no stock needed. Cash collections. No physical presence, thanks to our remote management. Thanks to our remote management system you do not need personnel. Do not leave a good business idea in your head. Undertake it and, if you do not have enough money to start it, you can access a loan designed especially for your self-service Laundromat. Enjoy flexible terms and a very advantageous interest rate. You will have the opportunity to finance part of your project, either for a 40-50m² or 50-70m² laundry. Fulfill now, your illusion of all life. We are specialists in making it easy for you and you will not have to move from the sofa to enjoy your money, everything is easy and fast. * Financing subject to personalized individual study. Financing of the work not included. The period of recovery of your investment in our self-service laundries is between 3 and 5 years.It is a crisis-proof business. no stock needed. Cash collections. No physical presence, thanks to our remote management. No staff costs, no stock needed. Cash collections. No physical presence, thanks to our remote management. What are you waiting for to be your own boss? 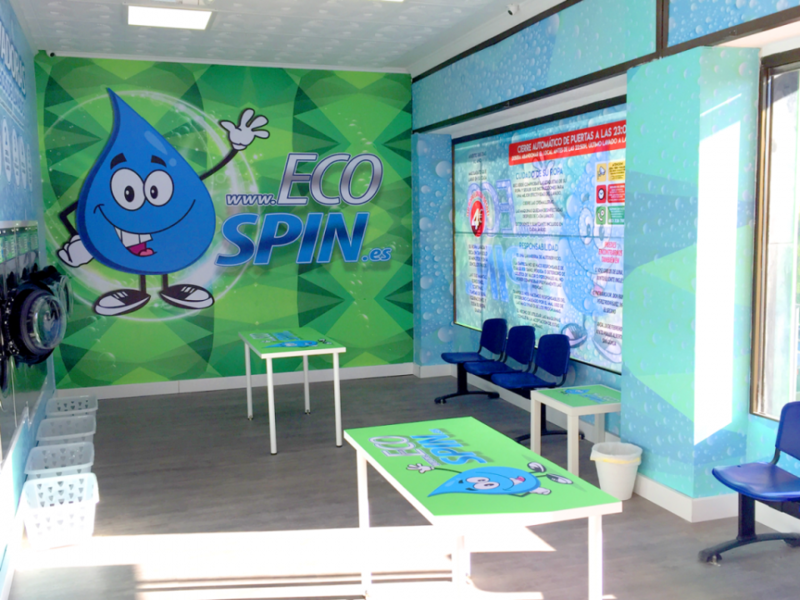 We need you to leave us some details to study and evaluate initially your proposal to open one of our EcoSpin self-service laundries. One of our partners will contact you as soon as your proposal is valued. Good news! 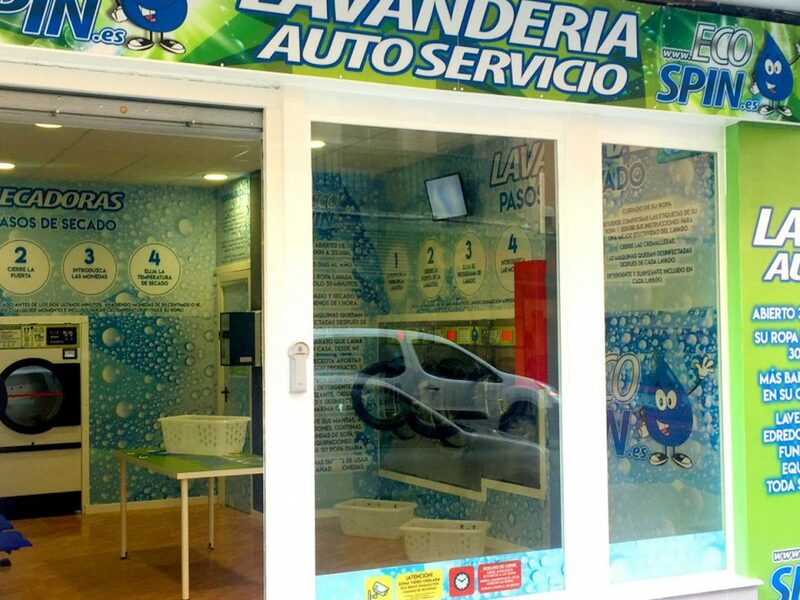 We opened 2 new self-service laundries in Algeciras! The first of them on Avenida Luxemburgo, number 1 next to Farmacia Álvarez in San José Artesano, in a magnificent 70m² premises equipped with 4 washing machines and 3 dryers. 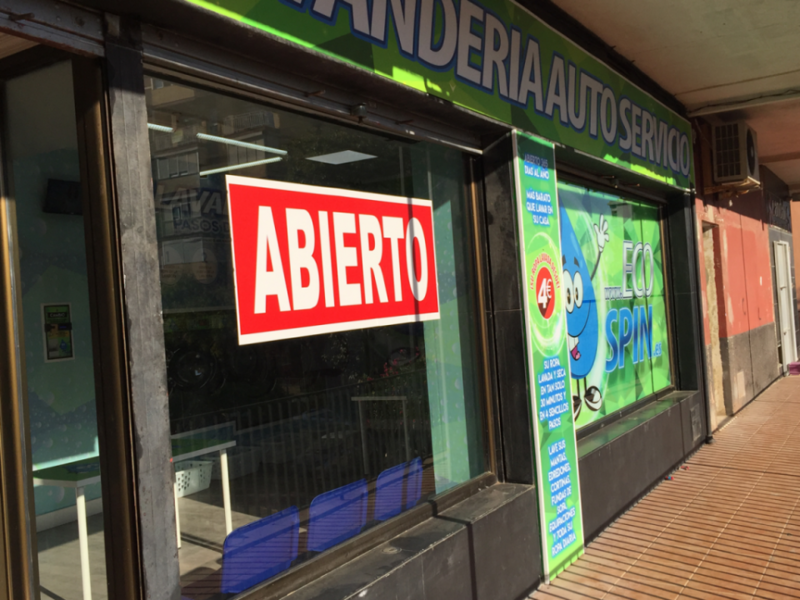 The next one at 8 de Febrero avenue next to Pollos Alberto, in San García, in a great 55m² premises equipped with 3 washing machines and 2 dryers plus all the standard characteristic comforts. 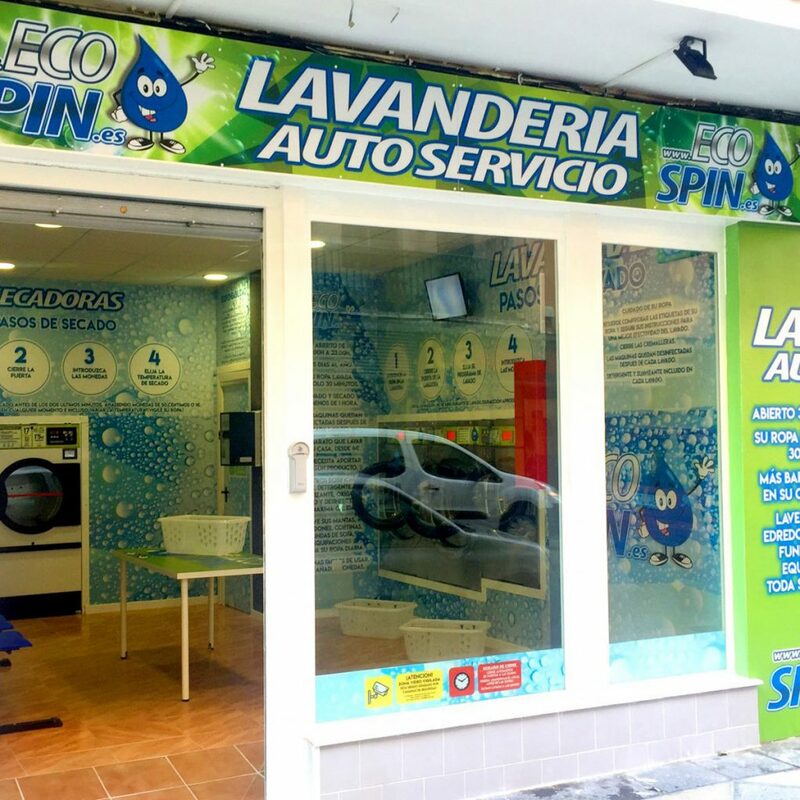 If you have a commercial vehicle you can also offer the washing and drying service with collection and delivery for large quantities of laundry. Relieve your customers of worries counting on your confidence and the quality of our equipment. 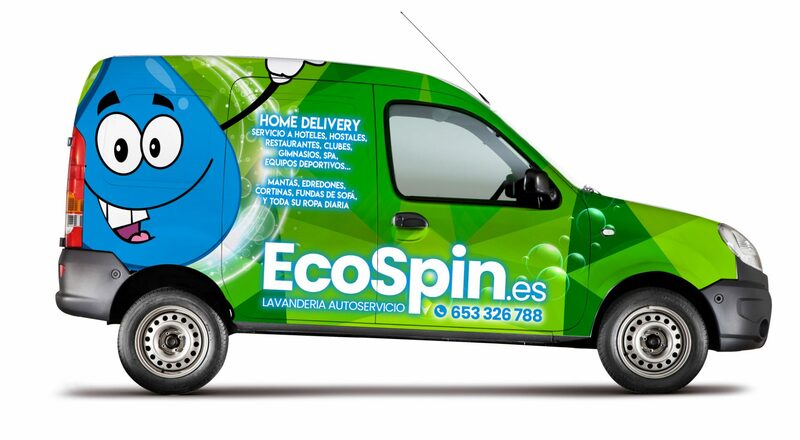 However, at EcoSpin we offer a personalized service and we will respond to your requests in order to adapt to your specific needs, always looking for the viability and maximum profitability of your investment. 1 IY-80 washing machine with 8 Kg capacity. 2 IY-135 washing machines with 14 Kg capacity. 2 DR-35 gas dryers with 17.5 Kg capacity. Integral signage of interior walls. Sign + banner on the main facade. Stickers and instructions for use in the equipment. Interior furniture (benches, tables, baskets, air freshener). Video surveillance system with security cameras. Project and management of licenses. Electrical and gas installation, plumbing, masonry, extractions of gas and vapors, paint. Water softener and 300L thermos flask. 2 IY-80 washing machines with 8 Kg capacity. 3 DR-35 gas dryers with 17.5 Kg capacity. 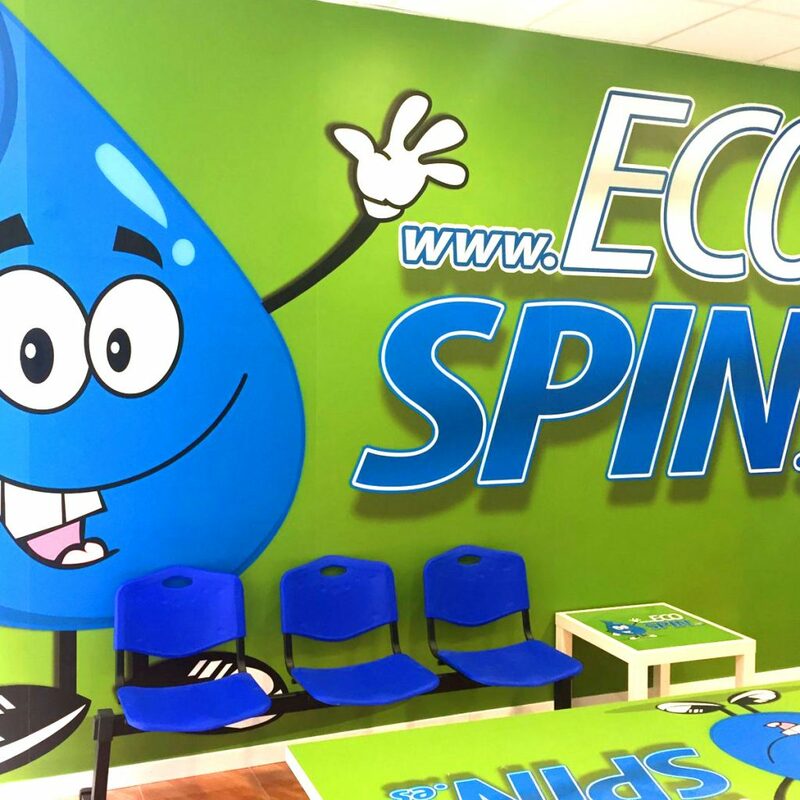 Thanks to the striking image of our EcoSpin stores! 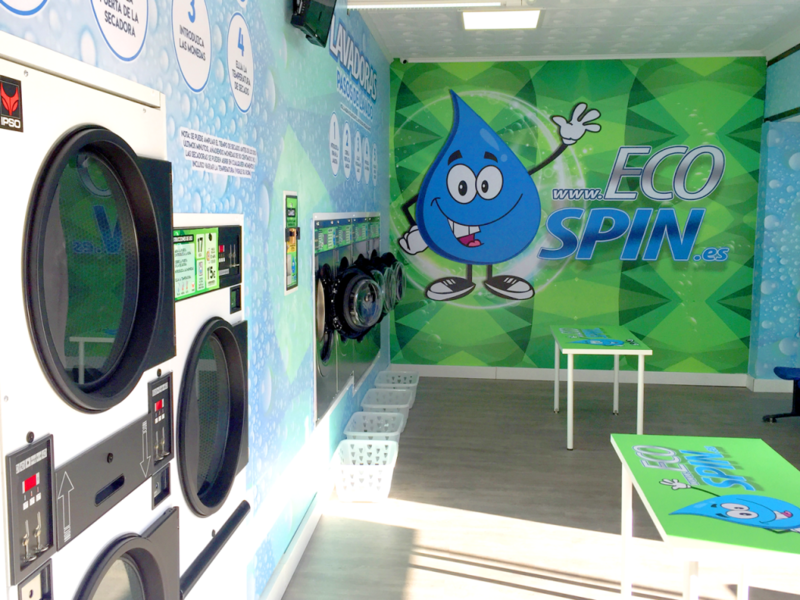 This could be your next EcoSpin self-service launderette! 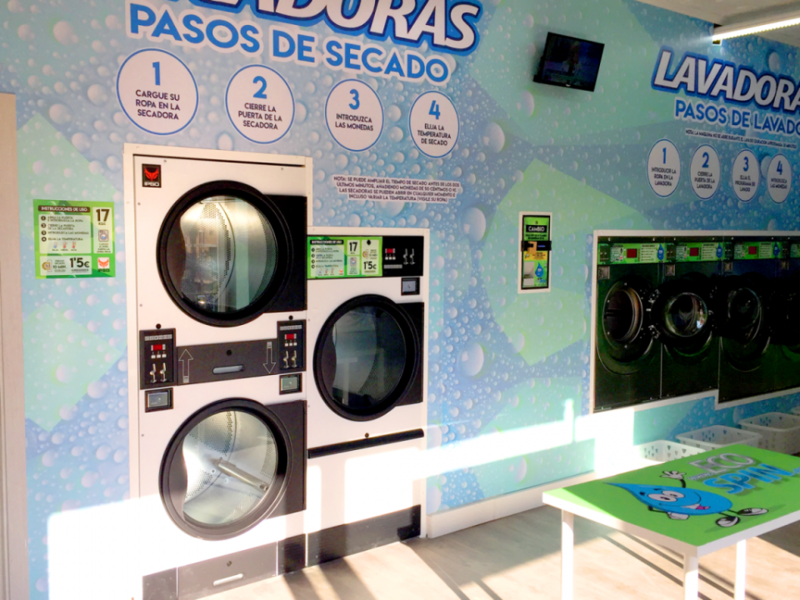 What are you waiting for to open your own laundromat? A different concept of innovative business with a minimum initial investment and a simple management without employees, in full boom and expansion with proven success.